Ghost nets are fishing nets that have been lost at sea, abandoned or discarded when they have become damaged. A seemingly harmless discarded fishing net, left to drift in the ocean can strangle a hapless sea turtle travelling to its nesting ground. Sharks, fish and other marine life all over the world have suffered this fate. 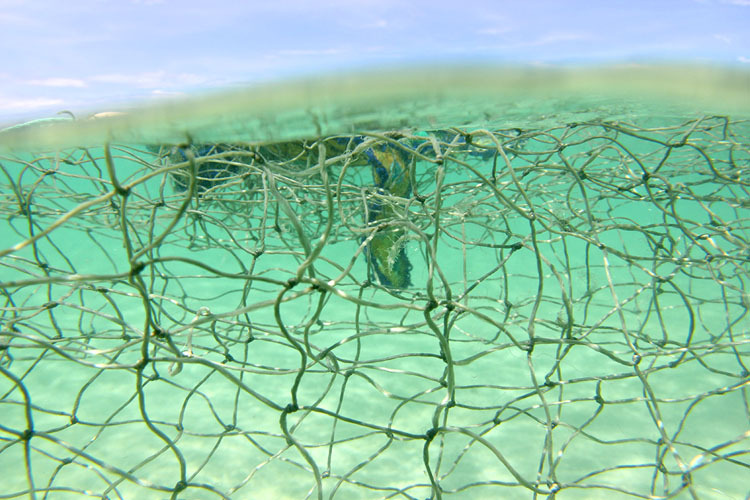 Abandoned nets destroy coral, as the tides drag the net repeatedly across the reef. Olive ridley turtle in a medley of ghost nets. Image: Jane Dermer, courtesy of Ghostnets Australia. Ghost nets are part of a larger problem: unsustainable fishing practices which add thousands of tonnes of plastic to the marine environment each year. These nets continue to float in the ocean's currents, entangling marine wildlife, damaging reefs, invisibly and silently killing. Erub, also known as Darnley Island, is one of 200 islands in Torres Strait. Located 160 kilometres north-east of Queensland's Cape York Peninsula, it lies very close to Papua New Guinea, and is one of Australia's most remote communities. Erub, also known as Darnley Island, in the Torres Strait, Australia. Image: Erub Arts. Erub is home to about 400 Erubam people. The artists at Erub Arts draw inspiration from their connection to traditional and contemporary stories about their land, sea and families. Erub is home to about 400 Erubam people. Image: Erub Arts. 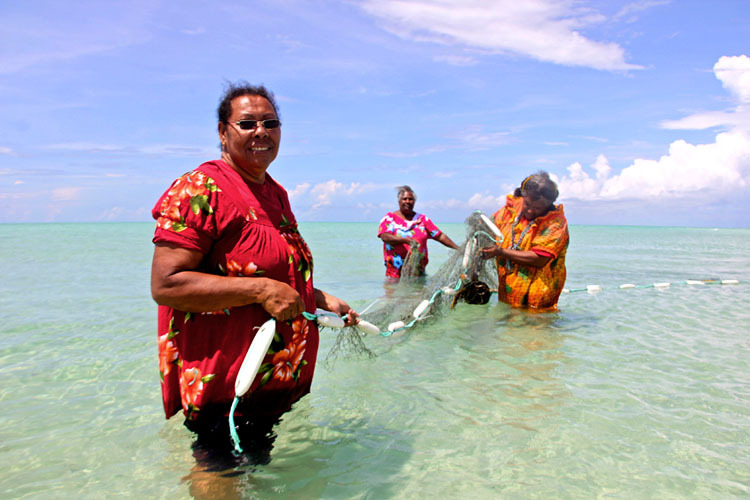 Each ghost net sculpture evokes the interconnection between the ocean, the Torres Strait Islanders and caring for country. Since 2010 Erub Arts have been working with reclaimed fishing nets. A collaboration between local Indigenous and non-Indigenous artists, the project finds new expressions for traditional weaving techniques. These sculptures have evolved to include sharks, turtles, waumer (frigate birds), schools of small fish, an outrigger canoe and even coral reefs. A collaboration between local Indigenous and non-Indigenous artists, the project finds new expressions for traditional weaving techniques. Image: Erub Arts. The Sea rangers of Erub recover the net as part of their coastal patrols, clean it and process it. Then the artists weave intricate works from the polyester and nylon fibres, twisting, twining and sewing the works by hand. 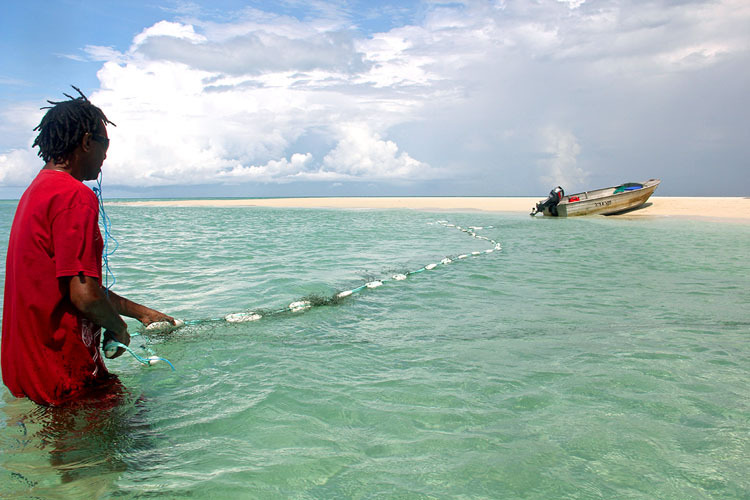 Between 2004 to 2014 over 14,000 ghost nets have been removed the shores of Erub. Image: Erub Arts. 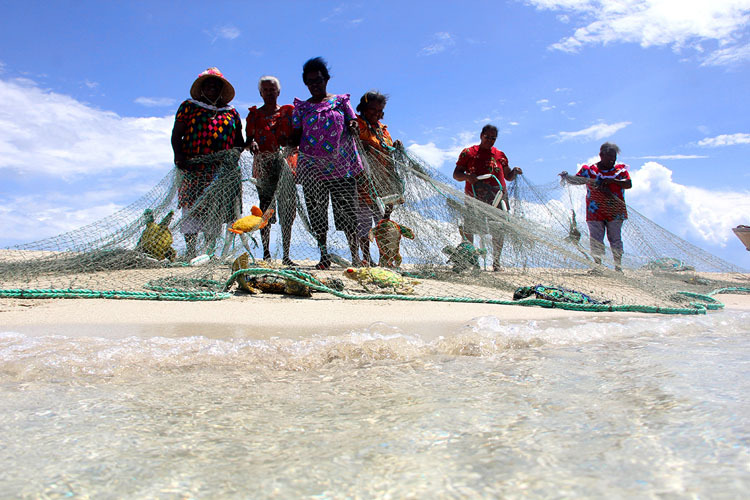 Between 2004 to 2014 over 14,000 ghost nets were removed the shores of Erub. These nets represent 80% of marine debris in the region. Globally, lost fishing nets, fishing lines, traps and pots from commercial fishing are part of the 640,000 tones of plastic which enter the marine environment each year. Repurposing the nets gives a second life to the marine debris – one which comments on the global use of plastic and modern fishing practices. Rangers recover, clean and process the net before the artists reuse the fibres to create ghost net art. Image: Erub Arts. For Torres Strait Islanders, the health of the ocean is crucial to their everyday life and essential to practising their enduring culture. The sculptures embody not only their intimate knowledge of the marine ecosystem but also the management of these resources. But the message of the ghost nets are universal: of preserving life, loss, recovery of and reducing marine debris. The ghost nets represent an ongoing connection between humanity's management of marine resources, ocean health and art. The clear waters of the Torres Strait. Image: Erub Arts. Turtles are the most common marine wildlife found entangle in ghost nets. Rangers rescue and rehabilitate any surviving turtles found in the recovered nets. It is estimated between 4,000-10,000 turtles were entangled in nets over the last decade. This is especially concerning, as Northern Australia and the Torres Strait are a feeding and nesting ground for six of the seven turtle species in the world. It is estimated between 4,000-10,000 turtles were entangled in nets over the last decade. Image: Erub Arts. Turtles hold special significance for the people of Erub: as a tribal totem and a traditional source of food, particularly for feasting and celebrations. Near the northern end of Erub is a reef called Emarr, a well-known turtle hunting ground. Torres Strait Islanders are mindful of taking only what they need. Part of the respect rendered to the sea is about making sure that marine stocks are available for future generations. The turtle is both a totem and food source for the people of Erub. Image: Erub Arts. To create the ghost net turtles, bits of net and rope are dismantled to form multicoloured clusters of fibre. These clusters are then sewn together over a steel frame to make the body and fleshy core of the animals, using a technique similar to felting. A combination of weaving and coiling techniques are used for the shell. Suddenly, through the artist's skill, marine debris is transformed into the splendid and dignified Emarr turtles. Seim Boy, a hammerhead shark. Image: Andrew Frolows/ANMM. Hammerhead sharks are native to the northwestern waters of Erub. Here the reef drops off quickly, and the sharks wait in the deeper water to hunt the stingrays swimming in the shallower waters of the nearby edge of the reef. Sharks are an important part of cultural and spiritual life for the Torres Strait Islanders. They are creator beings, totems and ancestors, powerful symbols of law and order. Hammerhead shark in a six-tonne gill net. Image: Jane Dermer, courtesy of Ghostnets Australia. Artist Jimmy K. Thaiday explores his stories, his people and culture through the medium of the ghost net. Caring for the marine environment, through reusing the dangerous debris is part caring for his country. The hammerhead shark is a totem of his, a connection to his ancestors. Thaiday made the large hammerhead Seim Boy. Contrast and texture were created by layering different gauge nets over the steel frame skeleton of the shark. "This marine debris is killing. Ghost nets are an environmental message to all...to share the significance of the oceans, to save them, one day at a time." In December, shoals of sardines enter the waters of the Torres Strait. These schools of fish are a feeding frenzy for the sharks, who dart through the throngs. Traditionally the sardines are fished in various ways, including spearing, throw nets and scoping them up on big funnel-shaped baskets called weres. Social media users to help create the 1,450 individual sardines. Image: Erub Arts. Artist Lynette Griffiths called upon social media users to help create the 1,450 individual sardines used in the shimmering curtain of Au Karem Ira Lamar Lu - Ghost Nets of the Ocean. So detailed are the works that there are two varieties of sardine, with unique eye colours and stripes on their side. These two varieties represent the native species in the water of Erub. The weres also speak of themes of sustainable fishing: a ghost of traditional stock management which is in stark contrast to the oversized trawling nets and fishing boats used today. The coral reefs are in danger of coral bleaching due to climate change and rising temperatures of the sea. Artist Marion Gaemers created colourful ghost net corals, with pops of orange and yellow among the calm blues and greens. Artist Marion Gaemers creation of colourful corals, with pops of orange and yellow among the calm blues and greens. Image: Erub Arts. These corals capture the kaleidoscope of life in the reefs. It also highlights an often forgotten aspect of the fishing net: that it comes in a variety of colours and sizes. In fact, these bright colours are often found within the larger white fishing ropes, hiding in the centre and are uncovered by the unwinding process. 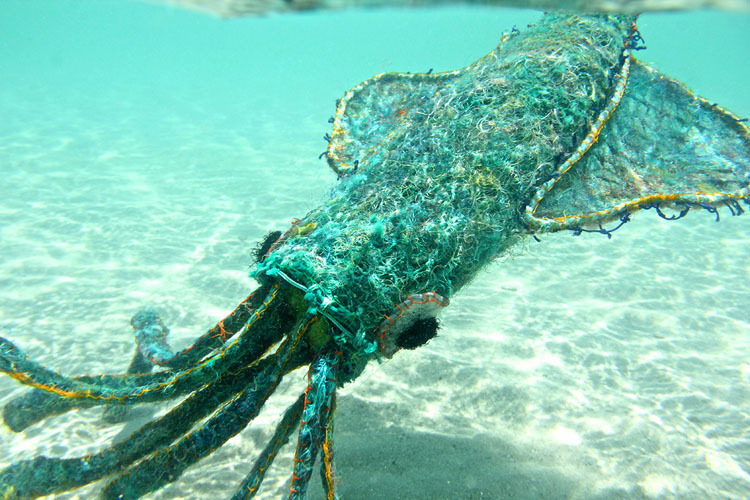 The sculptures are handmade with vibrantly coloured fishing nets. Image: Erub Arts. 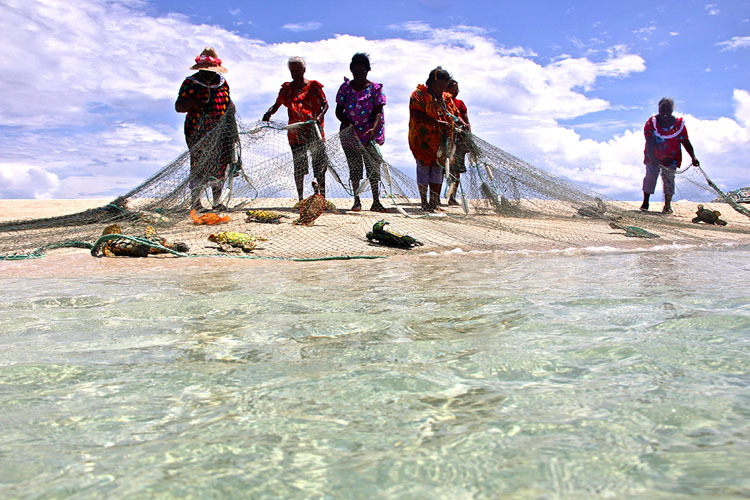 This is a reminder that no single net or fishing style causes the devastation of ghost nets but rather, a variety of fishing practices contribute to these environmental issues. In 2018, the Australian National Maritime Museum unveiled the Au Karem Ira Lamar Lu - Ghost Nets of the Ocean exhibition. This is the world's largest collection of ghost net art and a final resting place for the works which have been displayed at the Oceanographic Museum of Monaco and the Asian Civilisations Museum in Singapore. These colourful woven sculptures of turtles, sharks, sardines, coral and more, carry a message from the Torres Strait for the world to heed: The oceans are connected to everyone. Humans everywhere are affecting the world's oceans. "It all comes back to the sea. We are all connected by the world's oceans. Making art is really making meaning: my art helps me understand and make sense of the world." A global message from Erub. Image: Erub Arts.